Veterans on the Christian music scene Family Force 5 are ready to unleash their fourth album, Time Stands Still. Since their 2011 release III the band have signed to a new label, lost their founding lead vocalist Solomon “Soul Glow Activatr” Olds, and have adopted new band members with fittingly strange nicknames. Welcome, drummer Teddy “Hollywood” Boldt. With all these changes at hand, it would be expected that the band’s sound might have also evolved a little. Family Force 5 are well known for their party anthems, some of which have hit a mainstream audience. The good news is that there’s plenty more of this on Time Stands Still. As soon as you press play on this new album, you’re hit with opener Sweep the Leg. I was trying to work out exactly how to describe this track, but there was only one word that came to mind: WILD. It’s a banging party starter with crunchy metal guitars and warped synths. Like FF5’s previous hit Wobble, there’s not really a big message behind the track, but it is a lot of fun. The party is then raised to a new level on lead single BZRK (feat. KB). Musically, this song is driven with a great grind, robotic autotune, and a large dose of insanity. Just when you think the song has hit the roof, Reach Records rapper KB enters and completely and effortlessly smashes through his verse. Show Love leaves the grunt at the door and moves into more meaningful territory. The song speaks about showing God’s love to others as we have been shown it ourselves. Musically though, the song doesn’t take off in the way that the first two tracks do. Soon enough, the pop feels return, with the bass-heavy title track Time Stands Still and Walk on Water (feat. Melodie from Young & Free). The latter is dripping with pop synths and Melodie’s voice is just stunning. The song talks about having faith in Jesus and trusting that he has traded his life for us. We don’t need to look for signs or wonders because Jesus has already won the victory at the cross. The middle point of the record hosts a run of party songs kicking off with the thumping Glow in the Dark, containing a sound reminiscent of Sleigh Bells’ early records. Raised By Wolves is filled with heavy guitars while Jet Pack Kicks hits rap metal territory, and namechecks Marty McFly. XRAY is a mellow and reflective take on God seeing our hearts, and Let it Be Love harks back to the idea that Glow in the Dark started – that we are lights in a dark world, sharing the love of Christ. God’s constant love is praised on When Everything’s Changing as we’re reminded that while time passes and everything around us can change, God stays the same. Time Stands Still is a fun, enjoyable record but after listening, I realised it’s a mixed bag of tracks that can almost always fit into one of two categories: the crazy, fun, silly party anthems; or the meaningful, reflective, less-banging, God-centred worship tracks. By the end of the album this inconsistency had me wishing that maybe the two could be combined more than just maybe once or twice on the album. Why not have a super wild song celebrating in a raucous manner all that God has done in Jesus? After all, he’s the reason why we party! Obviously Family Force 5 are using their gifts to bring energy and joy to us as listeners, but why not bring some of the messages of the mellow tracks to the party? That said, Time Stands Still is a great album to get you amped for a weekend, or even for living for God in everything. I’m giving it three out of five stars. 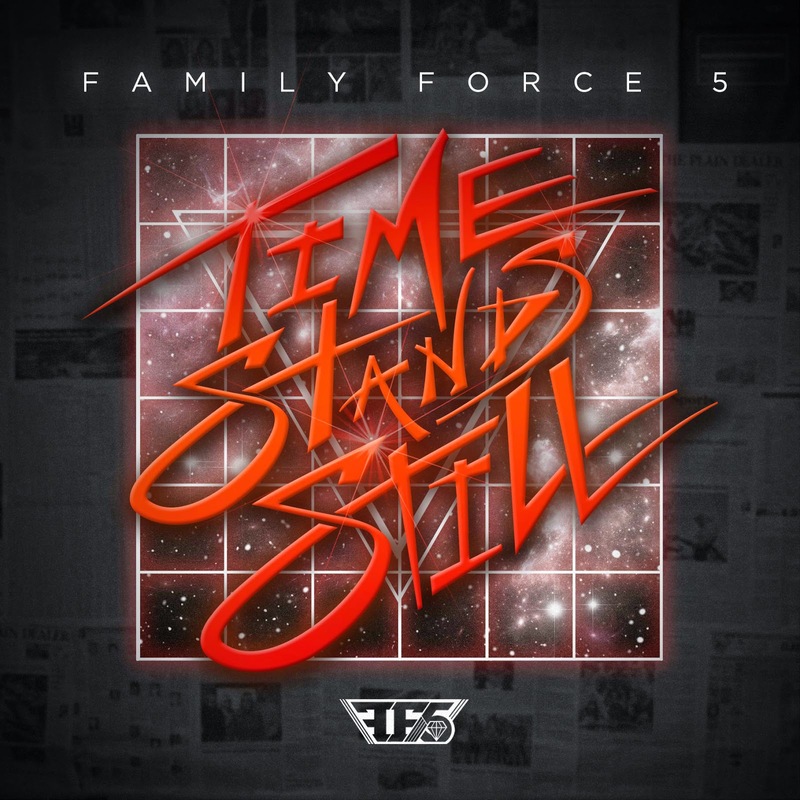 Time Stands Still by Family Force 5 will be released Tuesday, 5th August and can be pre-ordered now on iTunes. Posted in MusicTagged Album Review, christian, Family Force 5, KB, Time Stands StillBookmark the permalink.